Grumpy Monkey from Dr. Digi's House of Stamps got up on the wrong side of the bed and to make matters worse, Mrs. Ape forgot to get bananas from the grocer so his breakfast was pasty oatmeal! Let's hope his day improves! Du hast Grumpy wunderschön Coloriert. Deine Karte finde ich Suuuuper. FAB card. I love that image and your colouring is amazing. The way you had added the sentiment looks wonderful too. I know exactly how he feels! Tomorrow is another day! Your colouring is amazing Tammy! Good morning,Tammy. You sure have that technique down pat for colouring the fur. It really looks good! My day has already improved after seeing this delightful card!!! Tammy, this is sensational coloring on Mr. Ape!!! WOW! LOVE your card! So fun and cute. Funny! 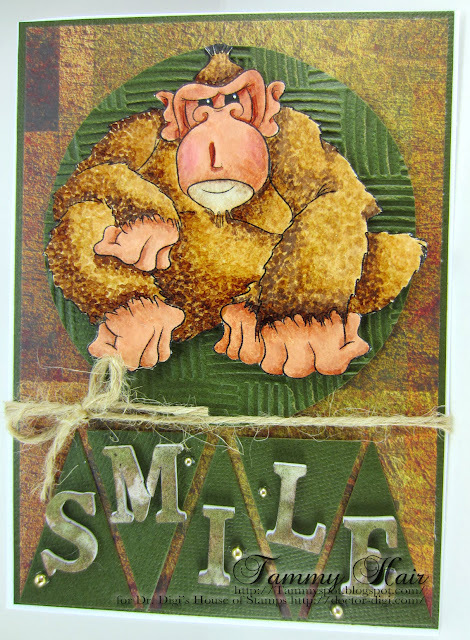 Great job coloring and adding all of that texture to grum monkey! Love it! What a fabulous card Tammy! Love your coloring of him and love how you did the sentiment. Fabulous card Tammy, outstanding colouring of this monkey. Poor ole guy. I am steering clear of him if he is hungry. He sure is a handsome fella thanks to your coloring. LOL this is just fabulous Tammy!!! What remarkable texture you have created on this sensational card, Tammy!! You are a master with those pens!! hee hee . . . he looks EXACTLY like he had oatmeal instead of bananas! Fabulous Tammy and your colouring is over-the-top! Tee hee! So funny! I was laughing before I even scrolled down to the card! LOVE how you colored the grumpy guy. Great card! This is fabulous! Fantastici coloring of his fur! I'm sure your stunning colouring will help him to smile. WOW! the coloring you did on this orangutan is amazing. totally reminds me of those soft teddy bears. How did you do that? And again, combined die cuts to spell out a message.